Risky maneuver likely killed skydiver in Calif.
PERRIS, Calif. - An experienced Canadian skydiver died at a Southern California drop zone after landing hard while attempting a high-speed maneuver known as "swooping," authorities said Wednesday. Michael Ungar, 32, of Aylmer, Ontario, died Tuesday at Perris Valley Skydiving, about 70 miles southeast of Los Angeles. It was the sixth death at the parachuting facility in the last 15 months. 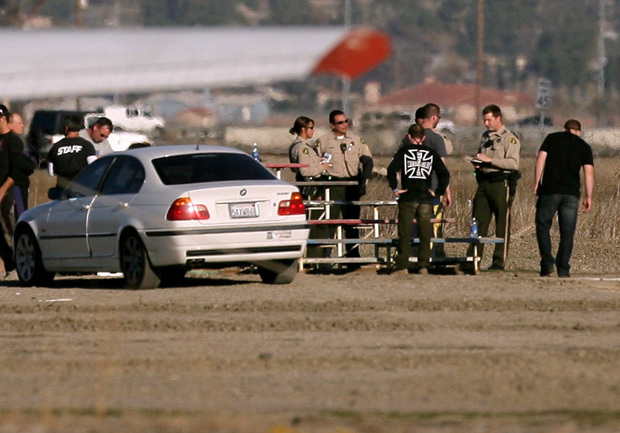 Skydiver killed on landing in Calif. Witnesses said Unger's parachute was open as he made the difficult maneuver and landed in a shallow pond. Friends pulled him out of the water, the Riverside County coroner and Perris police said in a release. Swooping involves a high-speed dive to skim over the ground before landing. Parachutists are often traveling 40 mph vertically and up to 60 mph horizontally just before touching down on the ground. "It's risky because you are moving so fast," said Jim Crouch, the safety director for the Fredericksburg, Va.-based United State Parachuting Association. "A lot of jumpers choose to land this way because it's exciting. But it's very unforgiving." Accidents occur when parachutists start the maneuver too low and the parachute doesn't have the ability to recover, or fill with air, and float the skydiver to the ground, Crouch said. The maneuver has become so popular there are swooping competitions at drop zones around the country, said Crouch, who describes it as "a sport within a sport." There have now been four sport parachuting swooping deaths nationwide this year, Crouch said. The highest death count involving the maneuver was seven in 2002. There were six in 2006 and four last year. "Jumpers are getting safer with this type of skydiving, (but) you can never completely take the risk out of it," Crouch said. The 33,000-member United States Parachute Association promotes safe skydiving through training, licensing and instructor-qualification programs. There are more than 140,000 jumps each year at Perris Valley Skydiving, one of the most active of 140 drop zones in the United States. Tuesday's accident marks at least the 14th death at the Perris facility since 2000 and the fifth this year. "It's been a bad year for them," Crouch said. "I know they have been working on getting everybody to jump as safe as possible. "It's a high-volume drop zone. The percentage doesn't point to them doing anything out of the ordinary." Perris Valley Skydiving center manager Dan Brodsky-Chenfeld said Ungar sometimes worked as an instructor at Skydive Hollister on California's Central Coast. Ungar, who had 2,000 jumps to his credit, was visiting the Perris area and had rarely, if ever, jumped at the facility, Brodsky-Chenfeld said. Ungar's parachute was open and he was circling as he neared the ground, witness Jack Nix, of Fontana, told the Riverside Press-Enterprise. But when he did not pull up or turn his body upright from parallel to the ground, Nix said he knew the skydiver was in trouble. Federal Aviation Administration spokesman Ian Gregor said the air safety regulator only investigates such deaths to determine whether the parachute was packed properly by a certified packer.  In April, two skydivers collided, killing Jacob Jensen, 32, of Denmark. The other man survived critical injuries.  Two skydivers were killed in March when their parachutes deflated and they fell 300 feet.  In February, a 41-year-old Australian woman died after failing to open a backup chute.  In September 2010, a 51-year-old Russian man died after a solo jump. The man's body was not found until two months later by a farmer plowing a field. His parachutes had not been deployed.